I was mixed in where to go to next. I knew I could make good mileage if I went 89 to 24. I figured Bryce National Park might be a good stop, but it would cost me in mileage. In the end, I figured take it slow through Utah as there is a lot of good stuff to see and it might be a long time before I get back here. Coming out of Cedar City, I took the 14 which was the great road from yesterday. 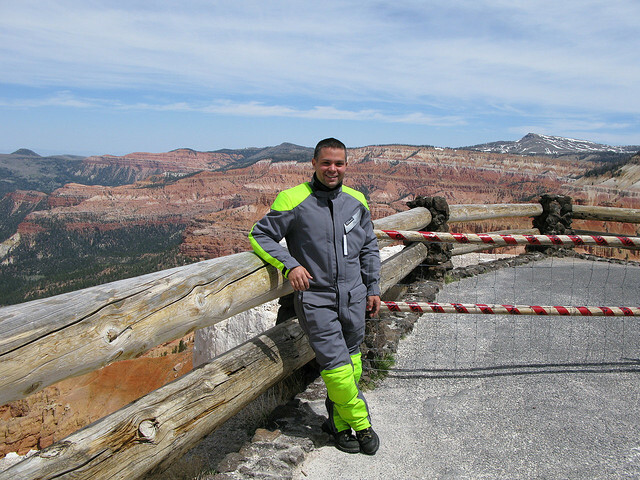 Instead of cutting over the pass I swung by Cedar Breaks National Monument. That was pretty cool. Utah has these deep canyons with all sorts of colors of stone in them. 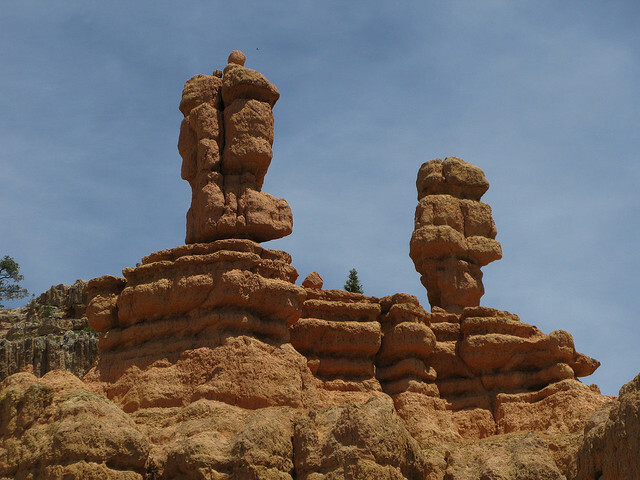 I’m no geologist, but this place has to be Disneyland for those who get their kicks out of rocks. On the way up I ran into Joe from the Rally. Both of us are headed toward Moab, but neither of us are sure how far we are going to get. Joe was taking dirt roads to get there, I was going to be on pavement. As I was heading into Bryce, I started to get hungry so I stopped at the “we serve all kinds of cuisine, but do nothing really well” sort of place. It looked better than Subway, so I figured I was ahead in that regard. After lunch though, I crossed paths with a yellow Triumph Tiger (remember the guyf from Friday who thought my bike was that bike). They do look markedly similar, but not that similar. Turns out he was doing the same sort of thing I was. Based out of Thousand Oaks, CA he was riding a bunch of the western states. We both got a kick out of the fact that each of us were doing “checkin” with back home so that those close to us know that we are safe. Bryce Canyon was really cool. The park was well laid out for those who can only do the “surface tour”. 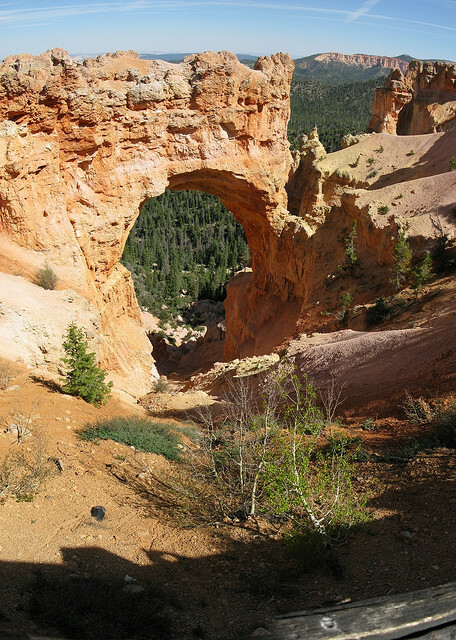 Much like Cedar Breaks, Bryce has deep canyons and valleys of differing colors of sandstone. It’s amazing that all this has been done just from water over time. The summer vacation surge is in full swing now. Sometimes it’s cool to soak it all in watching all the people around you from very different walks of life all coming to see in essence a big ditch. You see old folks, curious kids, grumpy teenagers, from all across the globe. I ran into some good folks from Mississippi who used to live in San Jose. They just had gotten married about a week ago and were traveling the west seeing all the parks. Hearing their schedule made me feel like I was putting along. Granted, they had a car, but hey, different strokes for different folks. I got to hear all about the Natchez trace and northern Mississippi so that if I find myself there, I’ll know where to go. 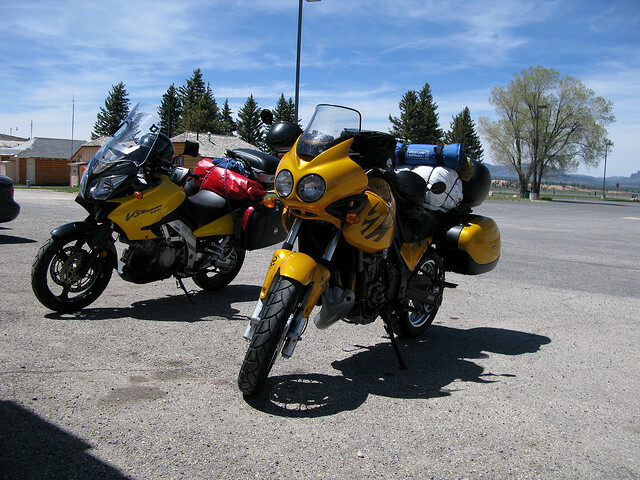 After leaving the park it was a nice cruise up highway 12 towards Torrey, UT. I had done some calling around to see where I might lay my head for the night but kept getting answering machines. Given that it was Sunday in rural Utah, I figured I’d figure it out once I got there. The ride up 12 was really cool. 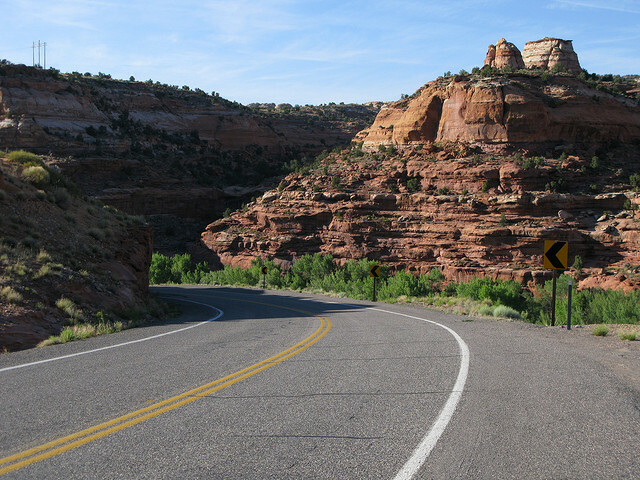 I passed through many sandstone canyons and high mountain mesas all the way. 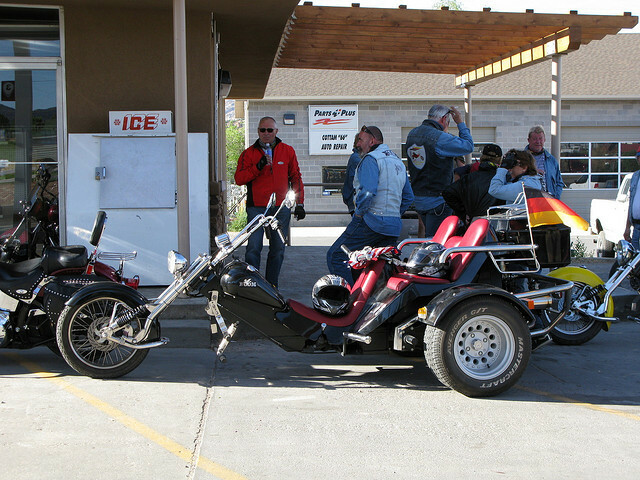 When arriving in Escalante, UT I ran into a group of Harley riders on bikes and trikes from Germany and Alberta. From Escalante the road got very technical very quick. It was slow going with some pretty incredible scenery. They say 12 is a true motorcycle road. That it was. 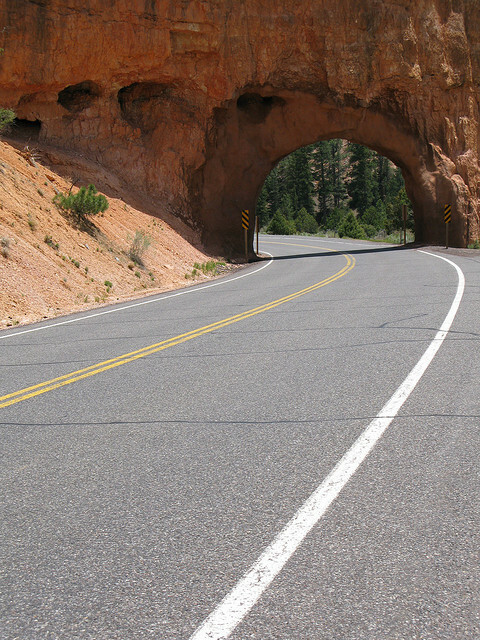 The tight turns, high passes with big drops on both sides, and wide open corners… truly heaven. There was one motel in Hanksville that I could not get a hold of and the day was quickly expiring. I didn’t make as many miles as I had wanted to, but you have those days. I found a place to crash in Torrey that seemed to fit the bill. On all of these trips I seem to strike out on food. Tonight’s fajitas were no exception. So alas, I’m fed, and tired and looking forward to another great day.